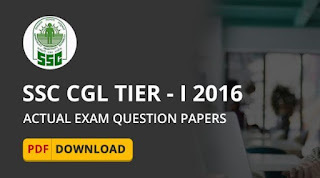 Today we are providing previous year SSC CGL 2016 Tier-I all 43 set question paper in single pdf. The Tier I exam for SSC CGL was take place between 27 August 2016 to 11 September 2016 in 43 different slots. SSC CGL is abbreviated as Staff Selection Commission Combined Graduate level Test. SSC CGL is a highly respected job and lakhs of students appear for the SSC CGL test every year to secure a job with the SSC. The SSC CGL or SSC combines Graduate Level exam every year for recruitment to non-technical Group B and Group C non-gazetted posts in various departments and ministries of the Government of India.